Who’s making these for christmas? They’re gloriously bronzed with a couple cloves of garlic, butter and a generous pinch of black pepper. 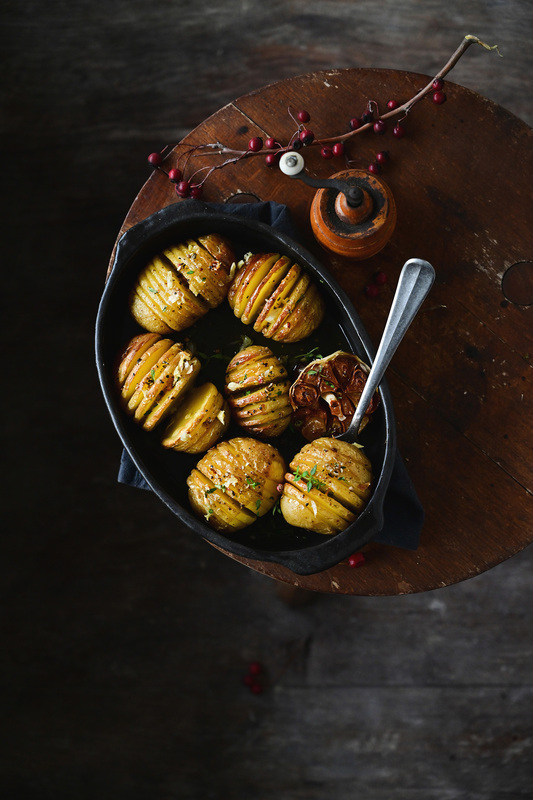 These crispy Hasselback potatoes make a simple and elegant side dish that both kids and adults love. Easy to make and absolutely amazing, all you need is a few ingredients and your oven will do the rest! Wash the potatoes and make a 2 mm incision. Place the potatoes on a baking sheet, season with salt and pour the olive oil. Bake for 20 minutes at 200°C. Reduce the temperature to 180°C and bake for another 15 minutes. Then pour butter on the potatoes, season with garlic, thyme and pepper, bake for another 5 minutes. Before serving, sprinkle with lemon zest. Enjoy! I’ve never made hasselback potatos, they always look like they might be a bit of a hassle. Hmmm, maybe that’s where the name comes from! Anyway, yours look so good that I’m now rethinking my strategy. They’re really easy to make! hope you love them, thank you! thank you Kellie! I will check the recipe, sounds divine! I’ve never made hassleback potatoes but have been wanting to for ages. These look so tempting and tasty. Butter and garlic can only make them even more delicious! thank you Cat, I hope you’ll give them a try! I’m such a sucker for hassleback potatoes! I would happily eat the whole lot and not share with anyone, they look soooo good! These are absolutely gorgeous, the perfect holiday side. I don’t know why I have never made these before. I really must, they look so good.